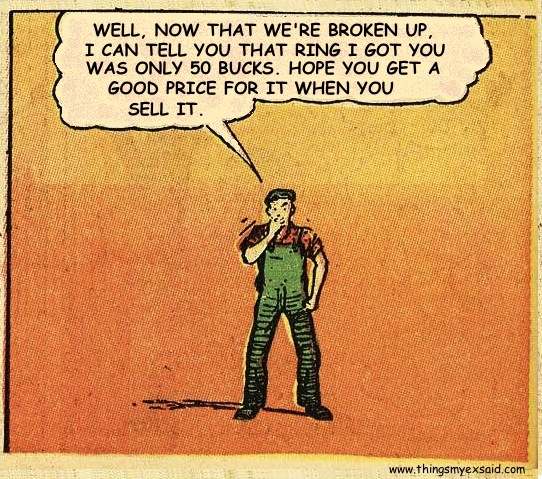 That ring I got you. Are you a sentimentalist or a pragmatist when it comes to a break up? Do you keep the mementos, or sell them to the highest bidder? Guess we’re going sentimental on this one. Thanks for liking my post! There are some hilarious and sometimes sad quotes on here. This one really hit home with me because I had an ex-boyfriend ask me for a ring he had engraved back so he could sell it. I ended up throwing it away in a Target parking lot.